It’s nearly showtime inside the historic auditorium of Lakewood, NJ’s Strand Theater this Thursday, Nov. 30, 2017 evening. 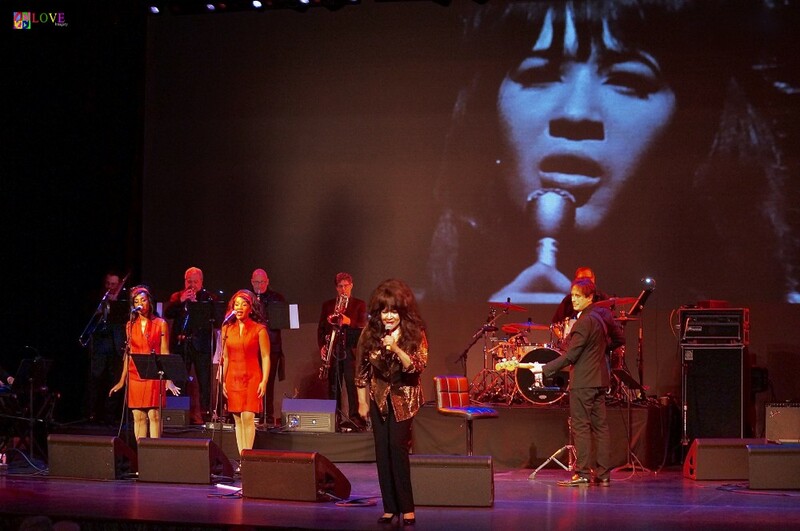 As we wait for tonight’s performance of Ronnie Spector’s Best Christmas Party Ever! 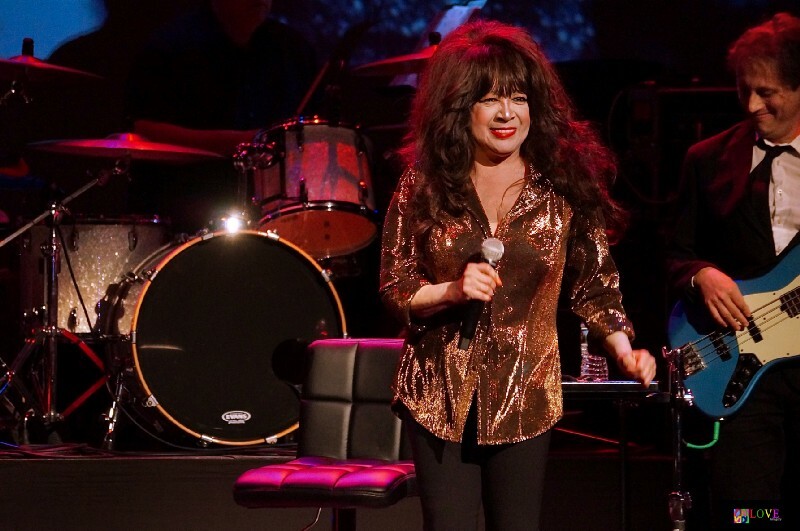 we chat with several music lovers in the audience who are ready to see music legend Ronnie Spector perform here live in just a few moments. 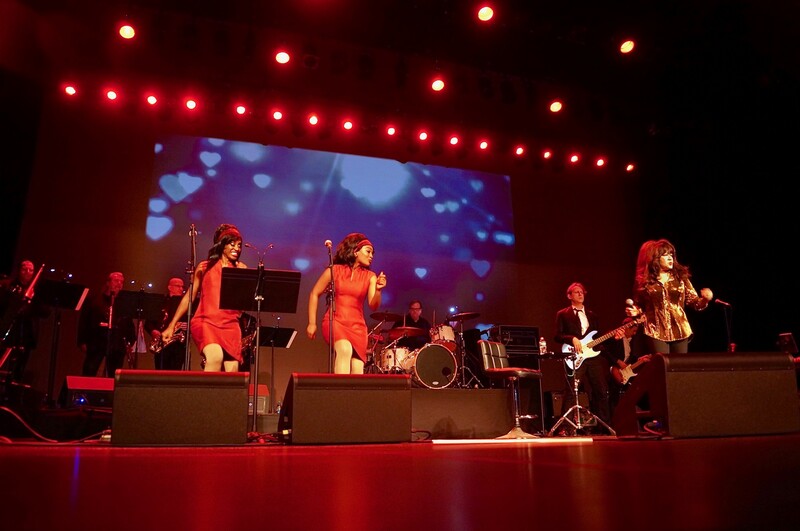 Dressed in a sparkling gold top and black slacks, Spector takes the stage singing the Christmas classic, “Frosty the Snowman.” Accompanied by a large band directed by bassist Jeremy Chatzky, Spector looks and sounds as good as ever as she smiles and sings and dances with her backup singers, The Ronettes. 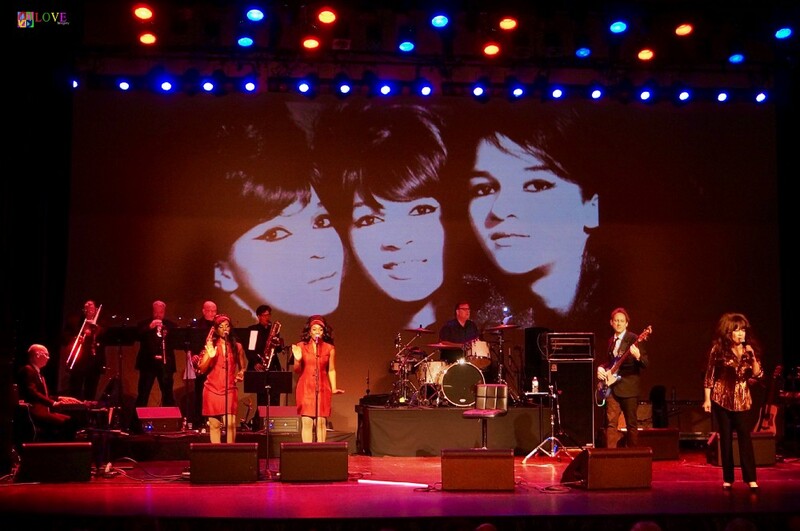 As the musicians perform, they put a little bit of holiday cheer in everyone’s hearts as a photo of the original Ronettes appears on the large screen behind them. 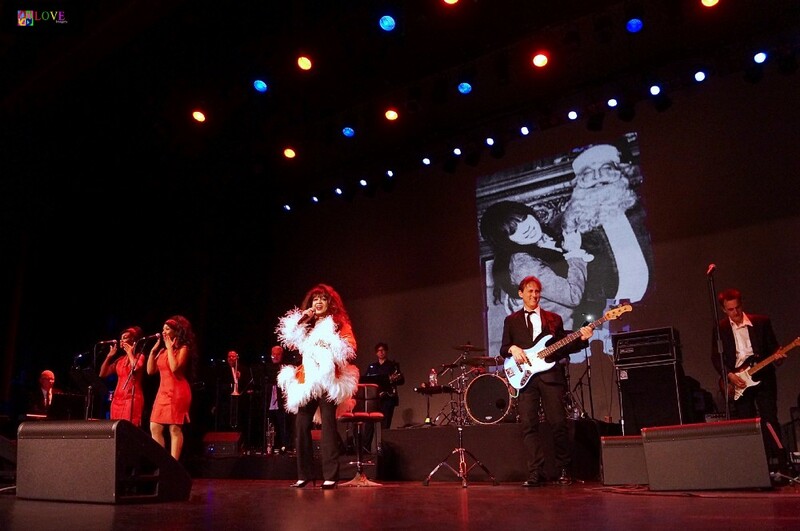 After revealing that, as a child, Santa Claus was her first crush and talking about how badly she wanted to meet him, Spector and the band launch into one of The Ronettes’ biggest hits — 1964’s “Do I Love You.” The beat of the drums propel the song ever forward as Ronnie wows the crowd with her legendary voice. Recalling, “When I recorded ‘Be My Baby,’ Brian Wilson was there peeking through the glass — he liked it so much he wrote a follow up to ‘Be My Baby’ just for me.” Here, Spector launches into her own rendition of The Beach Boys’ “Don’t Worry Baby.” As she expertly handles the lead, she brings a new dimension to the song with her easy understated performance while the horn section adds fullness to the overall rhythm section arrangement. 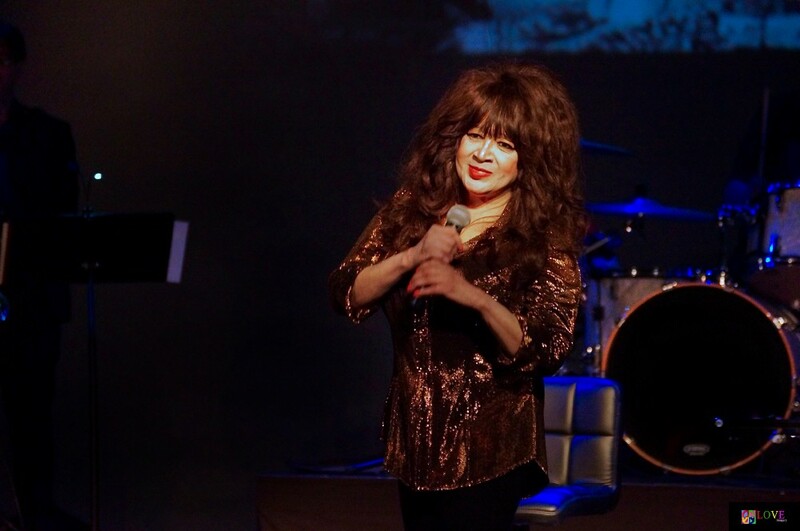 Dancing along with her back-up singers, Spector performs a dynamic rendition of The Ronettes’ 1963 hit, “Baby I Love You” to audience cheers. 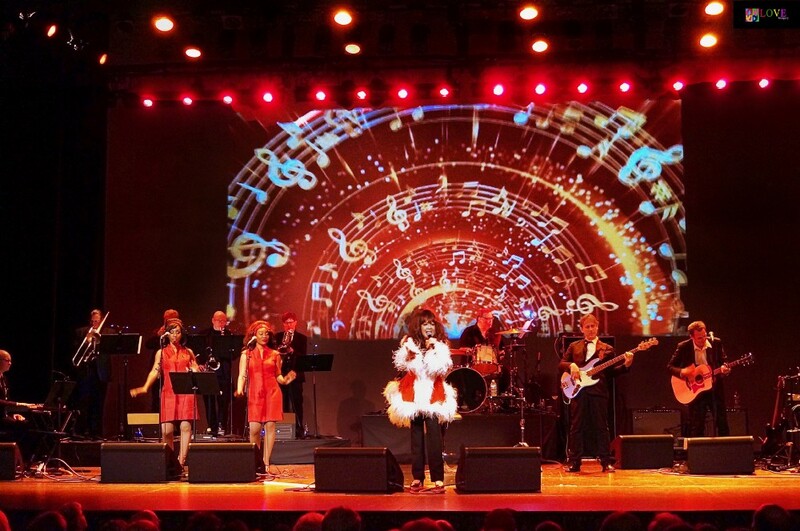 Revealing, “This is my first Christmas show of the year,” Spector tells the story about how the original Ronettes got their start in show business. According to Spector, back in the early 1960s, she and the other Ronettes happened to be outfitted in their tight dresses and wearing their “Cleopatra” make-up while visiting the trendy Peppermint Lounge in New York City. When the house band, Joey Dee and the Starliters — known for their hit song, “The Peppermint Twist” — took the stage ready to perform but couldn’t begin because their dancers hadn’t yet shown up, The Ronettes were asked to take the stage and dance instead. Moving on to a rockin’ version of The Ronettes’ 1963 Ray Charles’ cover “What’d I Say,” Spector tears down the house as an image of a 60’s-era Spector and The Ronettes dance on the screen behind her. After more applause and cheers, Spector asks, “How about ME?,” to which the crowd goes wild! 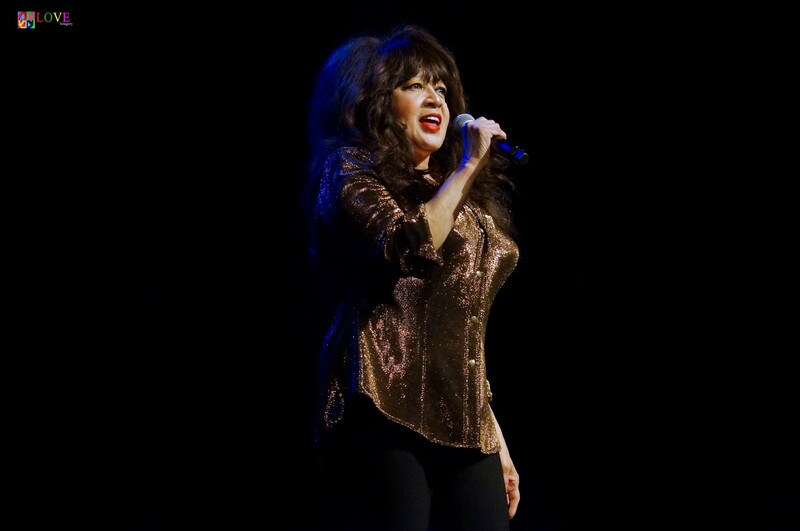 Acknowledging how much she’s always enjoyed doo-wop music, Spector performs a compelling rendition of The Ronettes’ 1964 “So Young,” as an image of a young Ronnie Spector lights up the screen. 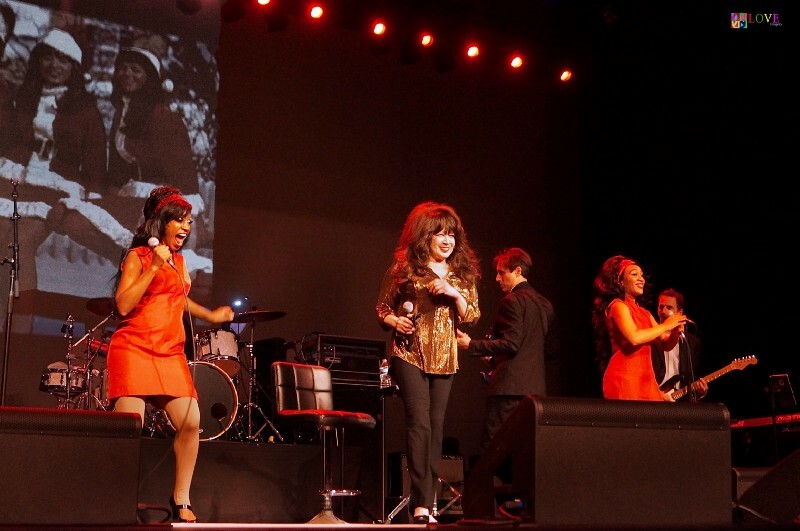 Segueing into a rhythmic rendition of the trio’s 1964 hit, “(The Best Part of) Breaking Up,” images of The Ronettes appear in various outfits as Spector and her current Ronettes perform live. The audience obviously enjoys the music as Spector and her singers tap their toes and pump their fists. Following a short intermission, Act II opens with the band performing a bouncy and jazzy rendition of “White Christmas” featuring dueling keyboard solos and a potent tenor sax solo. 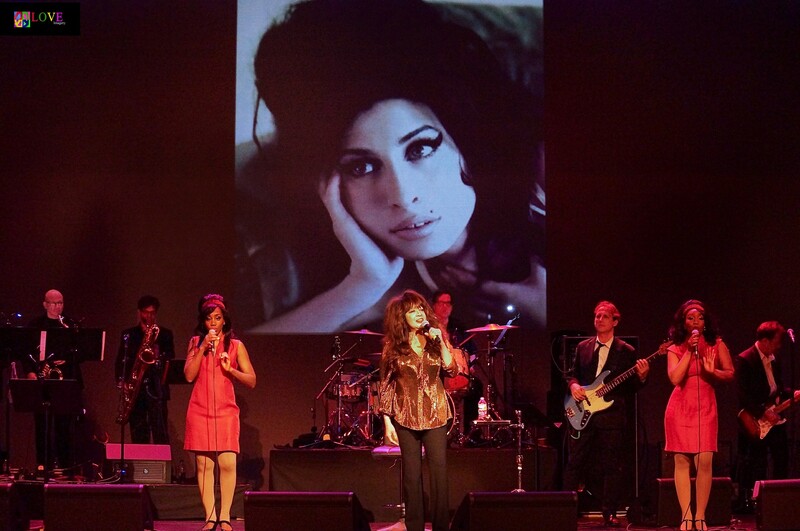 Ronnie talks about missing her late sister, Estelle — one of the original Ronettes — especially as the holidays approach. Wiping away tears, she performs a poignant rendition of The Bee Gees’ “How Can You Mend a Broken Heart.” This emotional tribute to Estelle tugs at the heartstrings of everyone present at The Strand. Moving on to one of the highlight numbers of the evening, Spector performs a tribute to a singer and musician whom she had a tremendous influence on — Amy Winehouse. Her voice sounding clear and full — and with her background singers and band exquisitely supporting her — Spector gives a soulful tour de force performance of the title song from Winehouse’s 2007 Grammy-winning album, Back to Black. 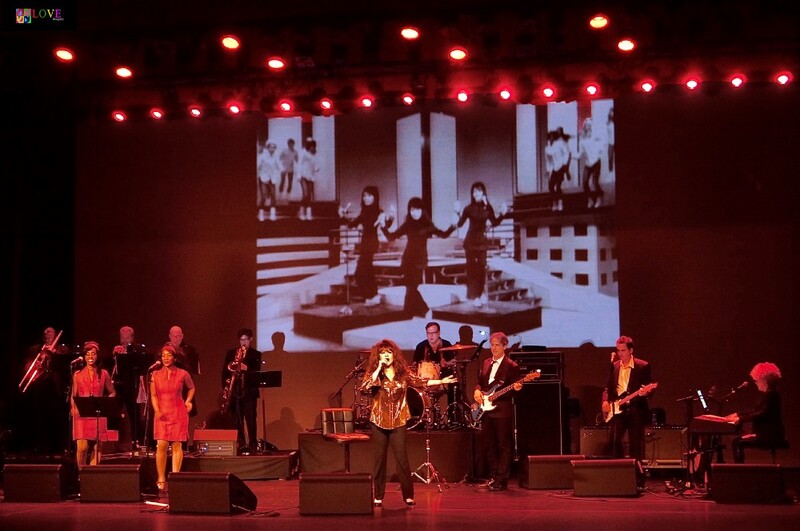 While the band accurately recreates record producer Phil Spector’s “wall of sound” right here at The Strand, Ronnie sings her heart out as she dances with The Ronettes, the audience clapping and singing along to this epic single. 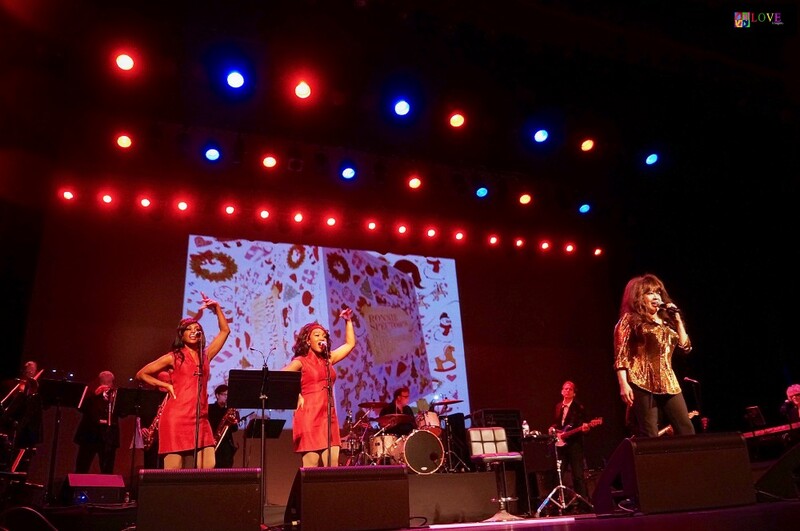 As the thoroughly-wowed crowd makes its way out of the auditorium, we chat with several concert-goers who share their thoughts about Ronnie Spector’s Best Christmas Party Ever! 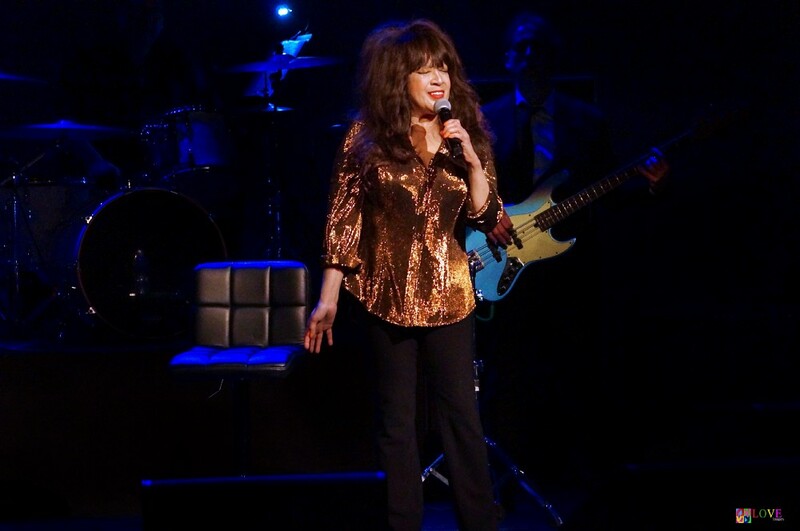 To learn more about Ronnie Spector, please go to ronniespector.com. For information on upcoming concerts at The Strand Theater — including Elvis! Ready to Rock starring Elvis Presley tribute artist Richie Santa on Jan. 6, 2018, The Cast of Beatlemania on Jan. 27, 2018, and Three Dog Night on Feb. 9, 2018 — please go to strand.org.